Can you believe it? 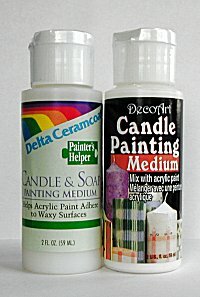 Paint products specifically made for painting on candles and soap are now available. Candle and Soap Paints can be purchased for painting directly onto candles and soaps. If you already own a ton of acrylic paints and don't want to invest in more paints, you can simple buy one bottle of candle and soap painting medium (both Delta and DecoArt manufacture this product). Simply mix equal parts of the candle and soap medium with acrylic paint and then stencil. Make sure to follow the bottle instructions for cleaning your candle/soap surface before painting. I used Delta's Candle and Soap Medium to paint a candle and had no problems whatsoever. It was simple. The medium also acts as a clear, protective layer so that your candle will withstand occasional handling. For projects that need a more protective coating, candle and soap varnish is available. What happens if you paint a candle with regular craft acrylic paints only? Over time, the paint lifts away from the candle creating a mess. There are now acrylic paints made for candle and soap stenciling/decorating. They are easy to use and clean up with soap and water. I've seen only a couple of brands in the craft stores. Delta and DecoArt are probably the most popular. But there are plenty available over the internet. I would suggest using a candle and soap varnish to protect your work. 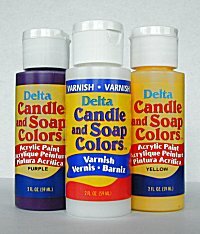 Just make sure to follow the bottle instructions for cleaning your candle/soap surface before painting as well varnishing.